Ok, I already laid out my big, overarching ideas here (a couple month back), so now for all the loose change. I've just today taken a decent shot at the current general release version InDev23, and these are what have struck me so far. I expect you may have already fixed some, but not checked out unstable 24 yet. I'm liking the updated, customised tips. Very timely and informative. Good user experience. Below is a (probably) non-exhaustive list of grammar errors in them that I've spotted. "NEXT TIP" button overlapped by "+1", "+2", etc. 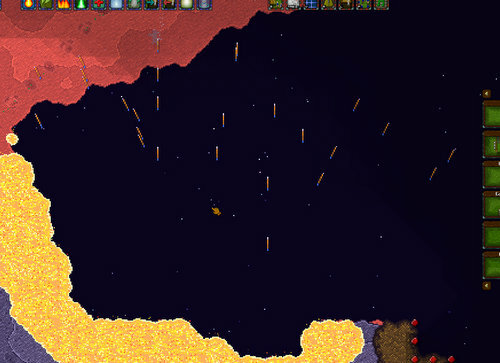 Tip - "Night[...] Hopefully you built *a* some defenses, like a Bow Tower!" -> remove 'a'. Also, there's no chance of having a functioning tower up first night, and not really needed then, so should say: before the monsters come, or something more open ended. Tip - " Ammo[...]The Bow Tower that your villagers just completed need[s] ammunition..., like a Bowyer or Rock Tumbler." - misinformation, reword to be specific, if being specific about tower type to start with. Tip - given after placing a building: "Refined materials...The Small Hovel you just tried to *reclaim* is..." - nope. 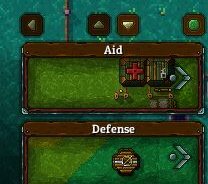 Tip - "Death[...] by making sure everybody has a home, [and] *or* building some defensive buildings." Tip - "Cullis Gates[...]on them to pull resources *of* [or] creatures out of limbo,[...]"
Can it also include a null track, i.e. music off option (to save having to quit out to main menu for settings). And a music volume control there too please (same reasoning as above). "Fallen Sky" has a sound effect that sound like a Skype message popping (in some other program), somewhat distracting. Menus make the scrolling noise on mouse wheel during game pause (despite not scrolling). "O" and "I" keys (shown on UI buttons, bottom right) don't seem to activate pause/dismantle tools. Hard to tell how many building slots Ancillaries provide, village centre too. Will you add an attribute for this to the selected building details? You should be able to cancel dismantling, that dismantle tool is dangerous, heh. Have shift-clicking with with tool selected un-mark buildings for destruction. Preferably also a cancel button in selected building interface (that I would prefer to a confirmation of destruction dialogue). But then that would extent even more to overall hunger (to get a quick idea if you are building up a population hunger deficit). I think you've already talked about more info displays on the way...? Hovering a villager/monster brings up their xp bar, also in green, hiding their health bar... Very confusing, and a nuisance during brawls (when trying to pick up monsters with the most health, etc). Could we have a different colour bar for XP indicator in the pop-up, at least? To be honest, it's not really all that useful to know fraction of a level, as there's not scope for micromanaging on that scale. But could maybe show health and XP bars on there with a bit of a layout twiddle about. Rock and stone are too similar (visually and their names). I'm always (still!) struggling to tell them apart (e.g. for build materials needed), unless they are side-by-side. Lumpy up the rock sprite a little more? Rename stone to "cut stone"? (From the "Stone Cuttery" after-all, lol). Starting a new map, could you have time paused until the village centre is first placed? Since you can't scroll around in pause mode and mini map is too mini to properly assess the lay of the land's resources. The second very quick game I just re-tried, villagers would *mostly* not go to get themselves some nearby food to eat (naturally occurring, within build limits), so most starved (I'd not built any farms at that point). A villager also starved to death while eating! LOL, a little harsh. I really like every single suggestion you have offered. Just noticed the issue with I and O shortcuts yesterday. I posted another thread with 3 more small things that I would like to see changed. 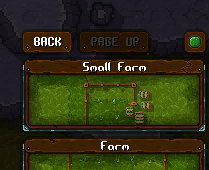 New, blue work progress bars on villagers. Screen scroll momentum seems to stop quicker (not rolling on for too, too long). Mouse pointer essence collection (I wondered for a long time what the tiny jingling noises were, thought they were punch up sounds effects for a bit). Not a major mechanic, it seems but really cool detailed touch. :-) Oh, I see, it actually becomes significant once slaying large waves of enemies - helps a little towards fireballing, but still a subtle enhancement. Builders harvesting nearby rocks, instead of fetching mined supplies from afar. Harder to weed out graveyards, building slot limitations, etc, I've already talked about elsewhere. Feels better balance now, deeper play. Tip - "Essence[...] That's Essence that has been released into the world*,*[.] Essence is the power[...]" -> comma to full stop. An abandoned building that's been reclaimed, then set to be dismantled, still shows materials requirement for rebuilding it (should surely be cancled). Tip - "Happiness" - Doesn't boost influence any more, right? (Was that an update change? Info needs editing out of tip, if so.) Also, it would be very handy to get an quick indication of average happiness, it's distribution, etc (as I said before with hunger). Tip - "Terrain Regrowth[...] You can cast 'Motivate Land' [on] the terrain too, *and* [to] accelerate the process." Tip - "Autumn[...] and stockpile [a] large amount of food[...]" -> add 'a'. Right click screen scrolling bug - position sometimes rapidly jumps a long distance when clicking straight after making a UI selection (building menu, god power, etc). Not 110% sure it's not just momentary frame lag, making it look that way. Announcement banners still show up with UI disabled (births, etc), getting in the way of screenshots. In world view, after exiting from a map, the mini-map preview had not updated to the most recent layout (missing buildings I'd just built). Builders should move off of completed wall sections onto player controlled tile when possible (seem like most the time they end up on the wrong side, when possible, having to be picked up to save getting into trouble and working their way back through the kill maze. Forges work far too fast, you only need one worker on the job for a few minutes to process all ore (and raw resource is very finite and limited). Have villagers move house spontaneously. (So old houses aren't rammed full while new ones are empty. Didn't check carefully this was still the case...?) Maybe also have a happiness factor that's decreased by over-crowding and decreased by too few fellow occupants (in bigger houses). Make ancillaries necessary to extend beyond a certain range from your village centre. Such that you can't just build them all in the middle. They'd function more like outposts, sub-regional HQs. You would have to be careful to be clear as to what factor was limiting expanding your control area (with a second colour/shaded of indicative grid area, and different tool-tip when trying to place a building in the region beyond HQ range but inside the area that should be extended to by minor buildings). Full Map screenshot (a real stretch goal, but would add functionality that can't be done (better) with a separate program). Screen shot numbers should continue sequentially, even when images are removed from folder (so named by date-time?). Currently end up with sets of overlapping names, awkward when moving piecemeal into a storage folder elsewhere. Abominable snowmen monsters during winter - In a style as homage to the Ski Free monster. (May run over, gobble a villager whole, do a little dance, then... Ski off?? Tunnellers (mole-men) - might make a an 'underground' passage past your walls that (a limited number of) other monsters can also use. 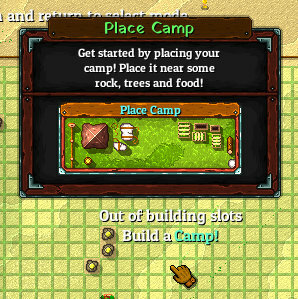 Functions as a portal with entrance and exit that can be destroyed like buildings by your villagers. 'Storkers' - big white bird, spawned randomly on each child birth. Flies into a random spot in your territory, storks around looking for a child to grab and abduct back to their nest (spawner), in (or by) water (they are a wading bird). When stalking/storking, they take off immediately when damaged (becoming untargetable). Player can grab child back from nest if spotted soon enough, otherwise a giant egg hatches, eats the child and turns into another storker. Makes a small surrounding area unpassable to monsters. Enables perimeter expansion: if the wall in front of it is taken down, a small additional area can be secured, building new walls inside it's bubble (then demolishing tower and inching forwards). It's area effect would be limited by walls. Uses essence at a fairly significant rate, such that it would be very tough to have more than, say, 2 running. Might require an attendant priest/wizard to operate, perhaps actually sat inside (if you start implementing villager controlled towers, too). Could think of it as camouflage, instead. Might prevent golems entering too (for balance). Might have to make the start-up/shut down procedure slow, if you want to avoid maze route 'juggling' (or make it a feature). Could have an anti-magic force-field gate instead, blocking monsters and/or golems. Again, power consuming, so they can't be used willy-nilly, in place of walls. Or requiring a gatekeeper villager. Recover lost/feral villagers for population boost.-> Nomads. Allow cooks to swap out stored raw food with rations (in houses, etc). To avoid storage space locking (with excess raw food.) Not certain this hasn't been cover already. Don't count each piece of fence as a building (in the count).-> Done. Toggle for add new construction to top/bottom (priority) of build list. (Shift click?) Not sure this would be that useful. Destroy resource could produces a small fraction of the normal raw material (say, at a rate roughly equivalent to builders extracting it). I very much like conservation of mass, as a principle, but understand that this can't be a way to bypass normal resource gathering, or take tooo long to destroy terrain. Gunner (tower operator academy) - for supplying new (more potent) towers that require a villager in them to function. Monster attractor/summoner - for farming essence (or other, new monster specific resource drops). Chapels/monasteries/altars/worship sites - Boosts influence accumulation rate and/or max amount (enabling new local/regional abilities). Actuary - to enable access to useful village statistical info-graphics (maybe). Nice to literally have a building for each thing; wiziwig. Similarly, no separate tech tree screens, preferably - everything unlocked via having a building physically present (and in use). Oh, and sorry to spam (I know you'll get around to these when you get time), but just remembered a major point I meant to make above: The building interface back button "<" is far too small. The other navigation buttons in that line are a little too small too but up/down buttons aren't really used, since everyone has a mouse wheel, and it's rare to want to hide the whole menu. Still, the back button should, I think, be made at least 4 times bigger in area. Expanding all four of those little buttons to fill the horizontal space (while staying square), might be a simple, neat-ish option. Ideally, given how common full HD monitors are with Steam gamers (I think? Laptops too? ), I really think there should be the option to have these menus (right and left of screen) to run the full height of the screen. There'd be no need to scroll up down on the build menu then, or the jobs menu for all of the early game. Thanks for taking feedback onboard, as always. Good stuff. Phew. Read through everything. As I play catch up over the next week I'll try to address everything..
For now though, I've ran through and fixed all the tip typos. Good eye. They're a bit hard to proofread on my end, so I suppose it's easy for me to miss things. Here's what it looks like on my end.